Talc, Mica, Octyldodecyl Stearoyl Stearate, C10-18 Triglycerides, Dimethicone, Ptfe, Cyclohexasiloxane, Silica, Methylparaben, Methicone, Sodium Dehydroacetate, Propylparaben, Dimethicone/Silsesquioxane Copolymer, Hydrogenated Lecithin May Contain/Peut Contenir: Iron Oxides. STEP 1. 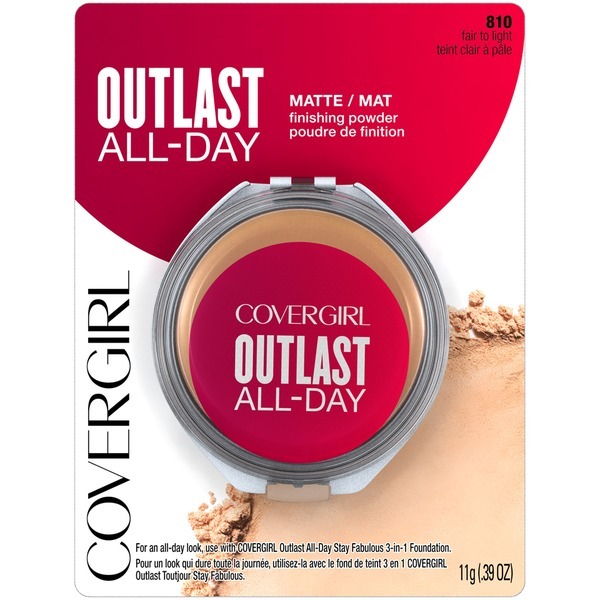 Apply Outlast All-Day Matte Finishing Powder., STEP 2. Use the powder applicator and starting on the apples of your cheeks, apply in a circular motion lightly rolling outward toward the hairline, avoiding the eyelids., STEP 3. To prevent a chalky finish, sweep off excess with a large powder brush.